President Trumplethinskin, a builder and promoter of luxury housing, naturally couldn't care less about the Department of Housing and Urban Development, which deals with -- ick! -- poor people, so he's nominating a man to oversee that department who can destroy it. Ben Carson knows he's unqualified. Or, at least, he knew it on November 15, when another cabinet post was dangled in front of him -- Health and Human Services. Dr. Carson had his mouthpiece, Armstrong Williams, tell The Hill at that time: "Dr. Carson feels he has no government experience, he's never run a federal agency. The last thing he would want to do was take a position that could cripple the presidency." He apparently went from not wanting to cripple Health and Human Services (Rep. Tom Price will gleefully do that job) to seeing the Christian value in crippling Housing and Urban Development. "I do care about the poor people. And in the system that we're putting together, there will be a rebate for people at the poverty level. But I also want to emphasize the fact that as we get the economy moving, and I hope I get a question about how do we get the economy moving, there will be a lot more opportunities for poor people not to be poor people because this is America. This is the land of dreams. And our policies should be aimed at allowing people to realize that dream" ("second-tier" debate, Fox Business, Nov. 10, 2015). 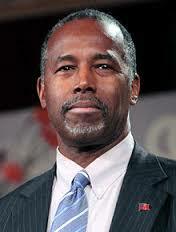 I won't make fun of Ben Carson - I really think there's something wrong with the man. The press - and Democrats in Congress who will be voting on his nomination - really need to dig more into exactly _why_ he left the field of medicine. There are enough suspicious reports out there about a large number of lawsuits and malpractice settlements that it needs some looking into.